آش رشته - Ash reshteh is a delicious thick soup made with chickpeas, beans, noodles and lots of fresh herbs. 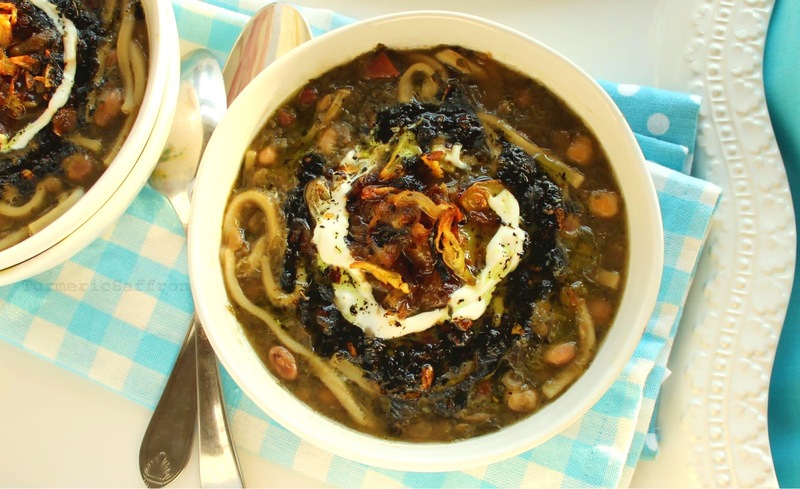 Ash reshteh is probably the most famous ash (soup) recipe from Iran. This hearty soup can be enjoyed all year round and is a perfect soup for a cold winter day. My mother used to make ash reshteh all the time and it's a favorite of mine as well. 6 ounces dried noodles for ash, you may find reshteh (noodles) in Persian/Iranian grocery stores. Place the chickpeas, beans and lentils in a large pot, add 8 cups of water, bring to a boil over medium-high heat. Reduce heat to medium, cover and cook for 1 1/2 - 2 hours or until beans are tender. Add the chopped vegetables, noodles, salt and pepper. Stir well, cover and cook for another 30-40 minutes on medium-low heat. Add more water if needed. Taste and adjust the seasoning. In medium pan, heat 3-4 tablespoons olive oil over medium-high heat. Add sliced onions and cook until golden. Add the garlic and saute for another 3-5 minutes. Add the turmeric powder, stir well. Add the dried mint and saute for 2-3 minutes. 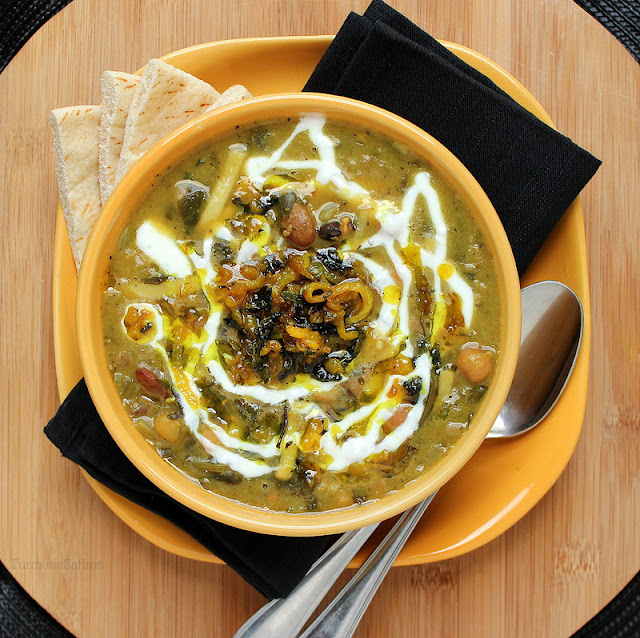 Pour the soup in a large serving bowl, top with fried onion, garlic and mint mixture, drizzle with liquid saffron and a generous amount of liquid kash. Serve hot with warm bread and extra kashk on the side. What if I have already cooked kidney beans and chickpeas? do I skip step 1? and go to step 2 with the kidney beans + chickpeas +water + parsley + scallions + cilantro all in the pot for 30 minutes? I will try it this week and let you know how it goes. So excited! My husband and I love Ash Reshteh! Since I have already cooked my beans and frozen them do I still use 8 cups water or do i reduce the water amount? Shy, add enough water to cover all the beans by 1 inch. You may need to add a bit more water if you're using dried noodles (reshteh). Do you have a suggestion as to a substitute for the kashk? Sadly I do not have access to a persian grocery store. Love your recipes! You can substitute kashk with thick yogurt or sour cream. Thanks! If you don't have kashk you can even use fresh lemon juice. It also taste good. Thanks so much for posting your lovely recipes! Do the beans need to be soaked before cooking? Yes, soak dried beans overnight (8 hours). Thank you. Amazing recipe Azita jan. This is absolutely delicious. I never thought I'd be making this in college, but the directions are easy and the smell is lingering in the building making other college students jealous. Thank you. Love this osh, one of my favourites and a great recipe, i bet the cilantro (coriander) brings out the sabzi flavours beautifully. The only thing i would do different (and this is a personal thing) is not use so much cir. 5 cloves is way too much for me. But i know some people that would eat raw garlic with this on the side, so each to their own. I was so excited to make this and everything was going great, but it was didn't turn out. You don't mention how much noodles you should use, so I had used 1lb of dried pasta and it turned into a starchy glob. I tried thinning it with water, but then the flavor was diluted. How much noodles do you use? Thank you in advance! Kristen, I'm sorry to hear the recipe didn't work out for you. I have made the necessary changes. For this recipe you'll need about 6 ounces of (Persian reshteh)dried flat noodles. Azita, I made this last night. I grew up w/my aunts making this ash all the time but haven't really been able to have persian food in about 10 years. Finally, last night, when I tried a spoon of it right before it was done, it was like I went back in time. I was sitting on the floor in my ameh's living room with all of my cousins around me, trying not to spill the soup on myself while I balanced the tahdigh in my other hand, guarding it from older kids. Your recipe took me right back to my family, and I can't thank you enough. It was delicious. Tarane jan, thank you very much for your kind words and I'm so glad you enjoyed this recipe! i have a question, i don't have any persian reshteh...can i use any kind of flat noodle as a substitute? thank you so much for this recipe!! Ghazal jan, yes you can. Negin jan, 1 cup of dried beans and 1 cup of dried chickpeas. Thank you! Finally found a great Persian cuisine website. I found you through Instagram and it has been a blessing! Love what you do and how you do it! Thanks for sharing. I want to use dried herbs in my Ash (it's a herb mix from the Persian grocery store). Does it have to be soaked or fried before adding it to the Ash and when do I add it and how much of it for your recipe? Salam, you can use one ounce to two ounces of dried herbs. Just soak the herbs in water for about 10 minutes, drain and follow the recipe. I recently found your blog - it's so aesthetic and appetizing! I made Ash Reshteh today and got a lot of compliments from my guests! Hello. I had this soup for the first time in my life last week in NYC at a restaurant called TOP, I cant wait to try it at home. Do you think I could use a crock pot? Mariana. Yes, you can use a crock pot! Thank you so much! The white liquid is kashk (liquid whey) which can be found in most Persian markets. I tried this recipe and thought it was quite nice....but it wasn't until the next day that the flavours came out more and now I can't get enough! I couldn't find the khask so used plain greek yogurt (quite delicious). Made your Ashe-Reshteh recipe yesterday & I must say it was FANTASTIC. We had some before I even had time to make the topping for it. Added a teaspoon of light sour cream to every bowl, as allergic to whey. Thank you so much for sharing your recipe with us all. This is a keeper in my recipe box. Could i use canned beans and lentils? Yes, you can use canned beans and lentils. Hi , would love to try out this recipe . Tried it at a Iranian restaurant and fell in love with it ! Can you please tell me which lentils to use ? Leila jan, you can use lamb or chicken stock in addition to water if you like, but it's not necessary. Hi Ivy. Yes, you can cook the beans in a pressure cooker and then add the herbs and noodles and cook the ash reshteh for an additional 20 minutes in order for all the flavors to come together.